Exclusive to Crystal Structures, our Barrel Ridge design is a unique metal framed skylight that uses a piece of curved tempered and laminated glass at the ridge to provide a beautiful focal point. Your eyes are naturally drawn to the highest point of the skylight and with our barrel ridge design, the view is OPEN which provides full focus on the sky. No metal framework at the apex. Ridgelites – A Traditional Favorite! Ridgelites are a traditional style of metal framed skylight. Their simple but attractive appearance has always been a favorite of architects. The design is functional and cost effective. By using our different systems you can obtain spans well into the 30’ range . They can be designed with or without glazed end walls. 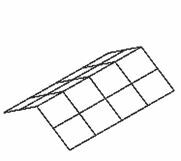 Saddle Ridgelites are the most economical form of metal framed skylights. Because the skylight straddles the building rooftop, there is no need for curbing. And, since there are no end walls, the glazing and framing costs are much less. Using our different systems we can obtain spans well into the 30’ range. Hipped Ridgelites are the same as traditional ridgelites except we replace the gable end walls with hips just like a hipped roof of a home. The hipped configuration gives the skylight a softer more elegant appearance and is the choice of many architects and designers. Using our different systems we can obtain spans we’ll into the 30’ range. Recognized world wide, the pyramid shape makes an attractive skylight. There is a great deal of work that goes into these magnificent structures in terms of glazing and framework but the finished product is well worth it. Using our different systems we can obtain spans well into the 30’ range. While not the most cost effective option, the finished product is worth the addtional expense. Sloped glazing is another term for a skylight with only one glazing plane. The fact that we are one of the country’s oldest providers of glazed structures and solariums make us uniquely qualified to design, manufacture and install sloped glazing systems. Our products have been designed to withstand virtually any type of weather. Sloped glazing adds daylight and a beautiful focal point in any construction. Using our different systems we can obtain spans well into the 25’ range. Polygon Skylights – Hexagons, Octagons and More! Geometric shapes are exciting and intriguing. We can build about any shape you can imagine. Using our different systems we can obtain spans well into the 30’ range. The cost of this item is higher due to the large number of trapezoid shaped glass pieces. Even though the cost is higher, these unique designs make a statement on any building. Custom Metal Framed Skylights – It’s Your Idea Let Us Help You Make it a Reality! Crystal Structures has proven to be one of the country’s best fabricators of custom metal framed skylights. We can mix and match systems, use steel for extra spans, bend aluminum, and integrate structural welding. A roof lantern / monitor are the same thing as clerestory, has the same design as any free standing glazed structure like solariums and conservatories. We’ve been building these unique structures since 1980. With several glazing systems to choose from, we’re confident we can meet your requirements. Low Profile Barrel Vaults are great for long narrow areas. Designed for smaller widths, usually 4’ to 8’ wide, they are made using our special framing system. They can be glazed with multi-wall or monolithic polycarbonate. Design restrictions apply so please contact our engineering team. 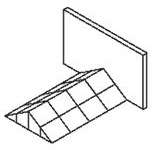 We offer three standard types of barrel vault skylights, half-circle, half circle with vertical legs and radius. All are usually glazed with polycarbonate, either monolithic or multi-wall. Due to the expansion and contraction ratios when using polycarbonate, there are some design restrictions. 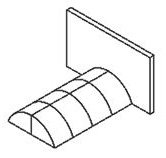 We recommend contacting our engineering team to assist in the design of your barrel vault skylight. An affordable skylight that is high quality, thermal efficient and installs fast! We have several standard sizes that will reduce the cost and enhance delivery schedules. We also can build special sizes and shapes.